Merry Christmas and an Elfing Happy New Year! Blinky is my new friend, who came to the party on Christmas Eve. As you can see, she’s an elf. Not just any old Tolkein elf (one of those is in the background of the photo) or fairy, but a real Christmas Elf. All the elves were invited to the house party, you see. She works in Santa’s workshop, though she doesn’t work on making toys. Blinky’s area of expertise is bows. She makes all the pretty bows to go on all the lovely presents that Santa takes to all the good boys and girls for Christmas. But Blinky isn’t just your run of the mill cheerful little elf. No, you see, there’s something very special about Blinky. She’s Santa’s only Punk Elf! She loves punk rock music and mosh pits. 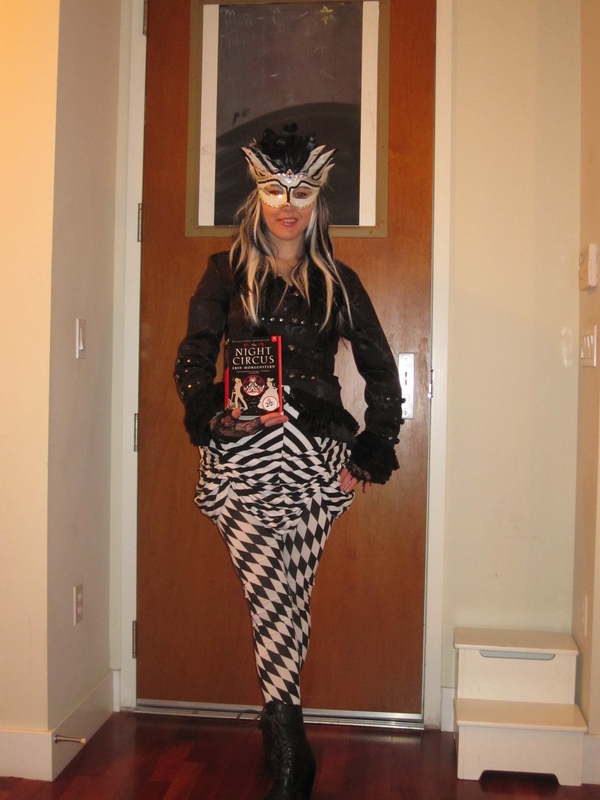 Since, I’m sure you’re just dying to know all about Blinky, I asked her to fill out a profile that I could share with my readers, so here’s everything you want to know about Blinky the Punk Rock Christmas Elf! New Year’s Eve Plans: Plan to have a blast wherever I may be! Goals for 2010: To launch her own fragrance line. I think we may be seeing more of this elf around. Happy New Year, everyone. Thank elfing heaven that another year has come to an end. Author peggyluwhoPosted on December 31, 2009 December 31, 2009 Categories holidaysTags Blinky, Christmas, costume, Elf4 Comments on Merry Christmas and an Elfing Happy New Year! I had two matching 4×4 picture frames to start with. 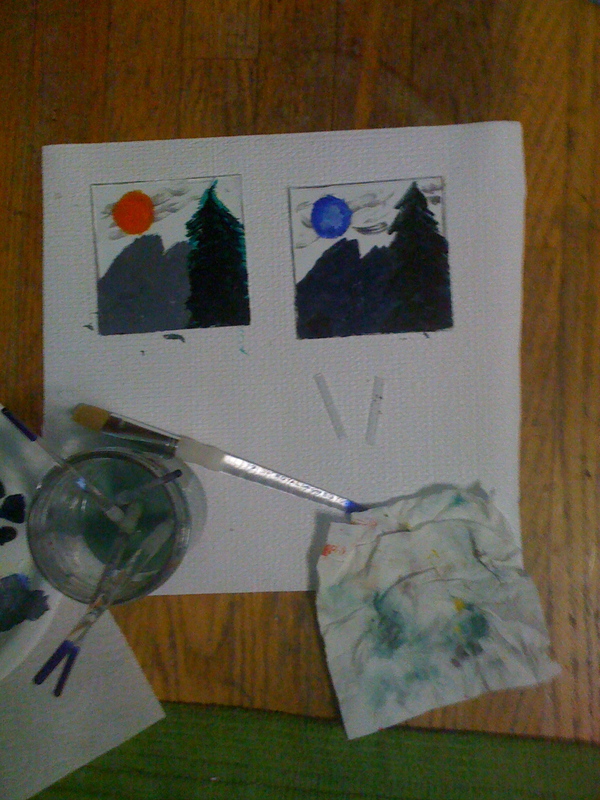 I decided to paint a matching scene on each, but one would be a day time scene, and one a night time scene. 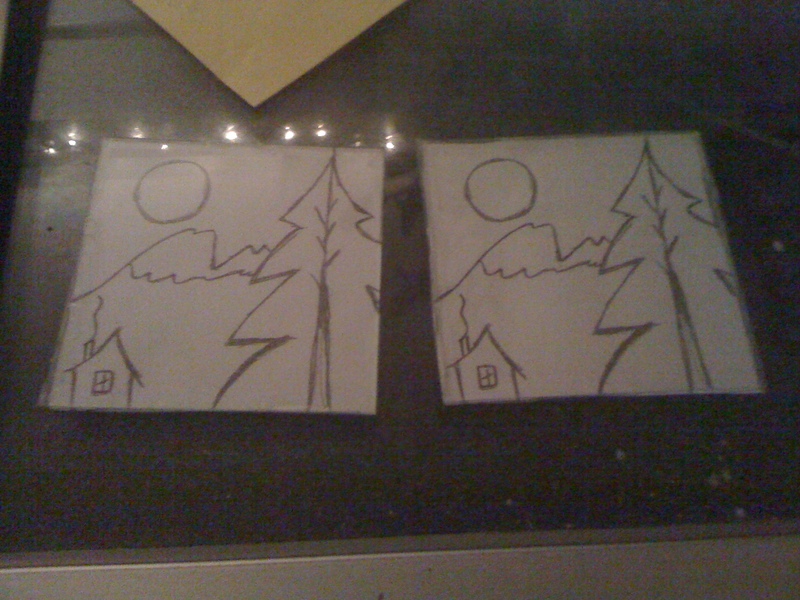 I traced the glass and drew a simple scene to fit the size, made two photocopies of the drawing, and then taped the drawings to the glass to use as my guide. I painted the two scenes simultaneously – side by side. 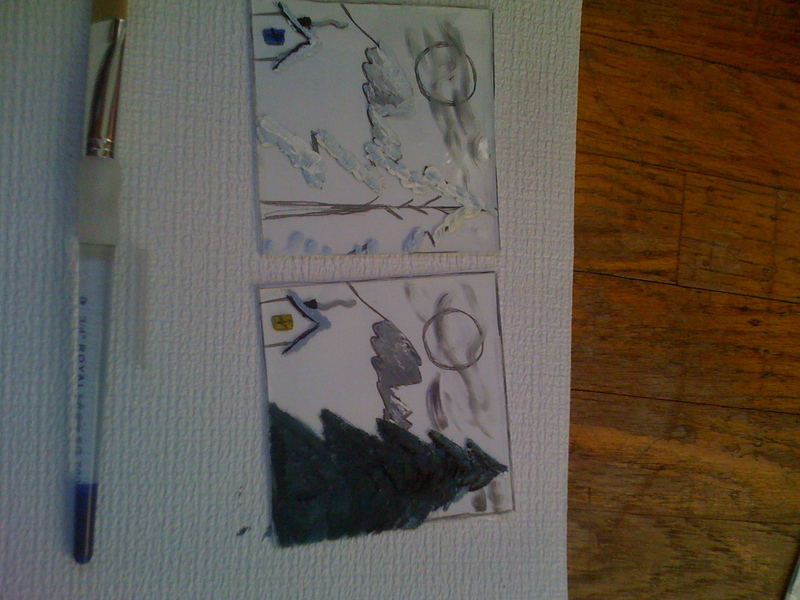 Since I was painting directly on the glass, I painted them in reverse, with the highlights and foreground painted first. I did all of this on the floor of my bedroom. It was a lot of fun, but at times it was hard to be patient while I waited for the paint to dry. 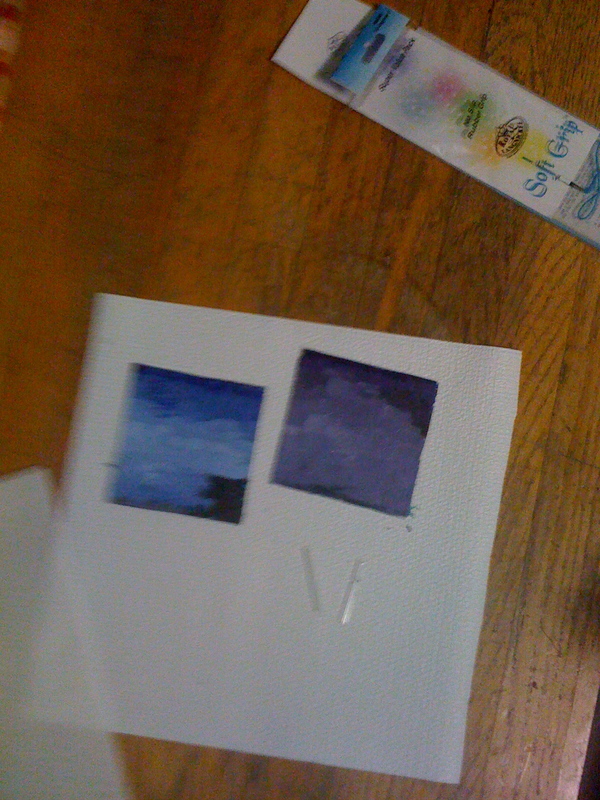 Oh, and about the paint, it’s acrylic. Finally I got to tackle the sun and moon which really set the two apart. These pictures aren’t the absolute greatest, because I took them with my phone. I still need to get a new camera. 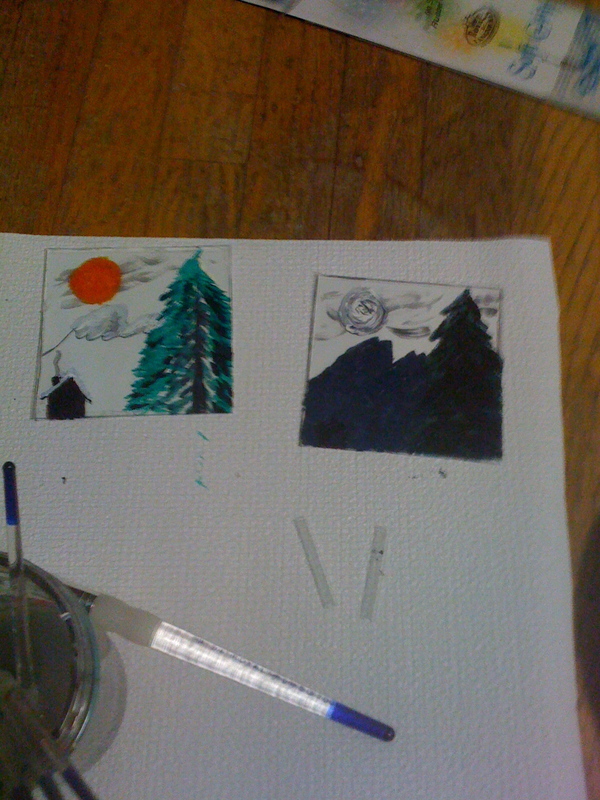 I filled in the last of the sun and moon, and the finished off the trees and mountains, too. Lastly, I filled in the sky for the background. I decided to make the night sky purple so that the scene would stand out. Makes sense, really if there’s a full moon, right? Then I had to let them dry over night. This was the tense part, because I couldn’t really see how they turned out. The view from the front was covered by the drawing, and all I could see from the painted side was the last coat. 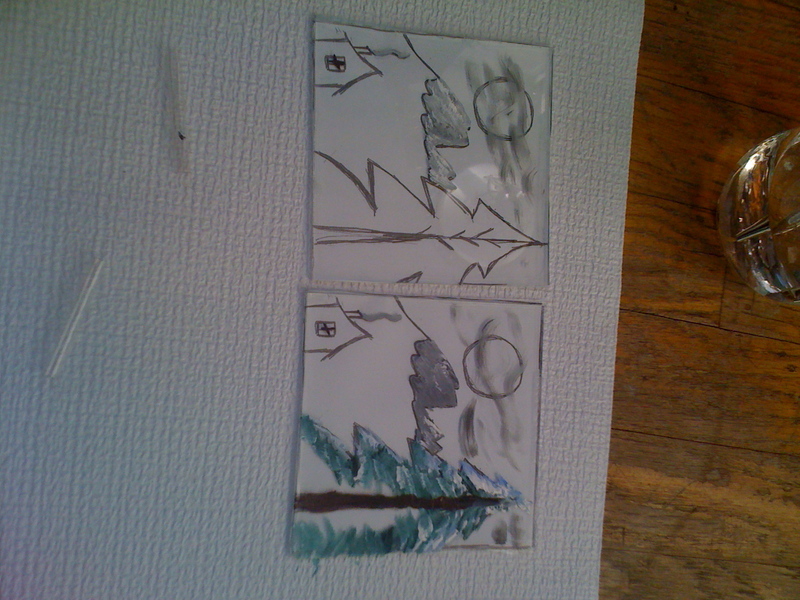 I didn’t want to take the guides off until it was dry, because I was worried that I would smear the paint. The next morning I carefully removed the drawings and tape to reveal the paintings and placed them in their frames. Even my art student housemate was impressed, so I must have done something right. 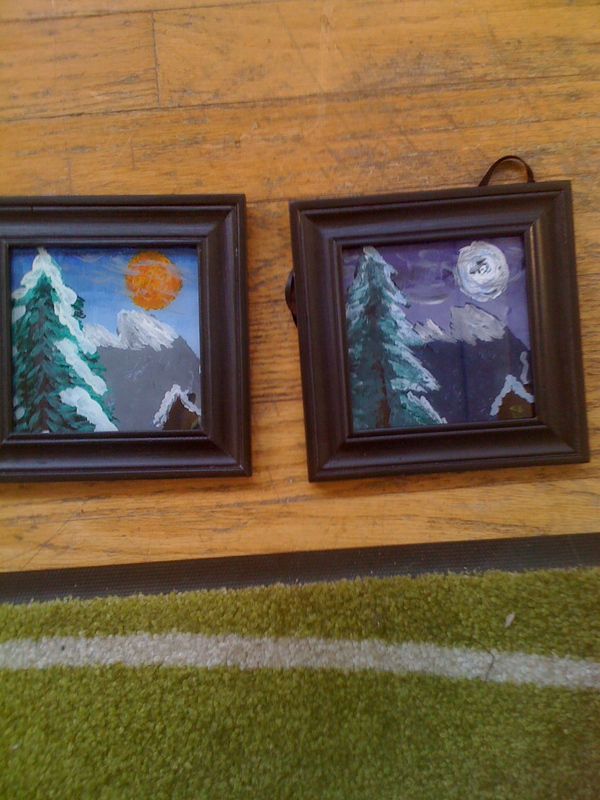 Mom and Dad liked them very much, and said they’re planning on hanging them together somewhere in the house. I’m an artistic genius, it seems. I am the slackerist slacker in all of blog-ville. There used to be a time when every few hours I would think to myself, that would make for an interesting story for the blog. That time was last year, apparently. Seriously. And it’s not just the blog. I just opened my journal, and I haven’t written anything in that thing in over a year. Of course, every time I get on here I start blah blah blahing about how I’m going to write more, and how I have a good one I’ve thought of that I’ll work on just as soon as I have time. Of course I’ve forgotten all those good ideas. Of course. So here we are, quickly approaching the end of another year, and I have even less to show for it than I did last year. Gah! So, if you’re wondering at all, I’m over here doing my thing, working, hanging out with my friends, going to shows, and pretending to be a musician. 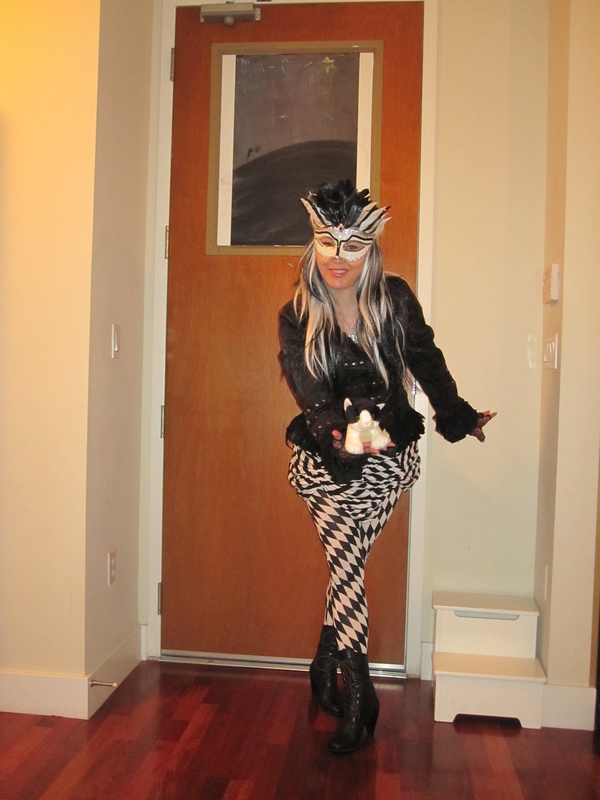 Oh, and my camera broke, so I can’t even take any interesting pictures, but here’s one someone took of me from Halloween. I was an Ice Princess. 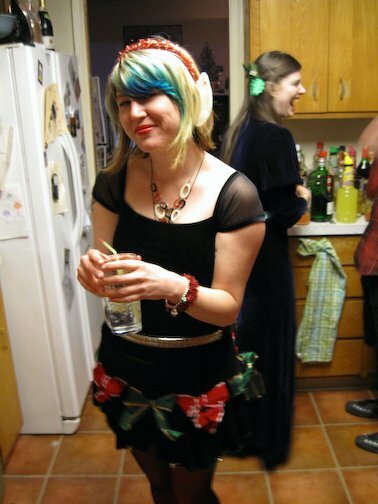 And since I went to The Phenomenauts’ Zombie Party, I was a Zombie Ice Princess. I came up with a pretty elaborate story about how I was the Princess Winter who pined only for one Prince who wouldn’t have her. After years of pining, she became increasingly more and more frigid and bitter until my pining was replaced with a lust for human brains. Plus, I got to reuse that bridesmaid dress. Win! Anyway, that’s what I’ve been up to. . . . and as for the rest, well you know.. . .